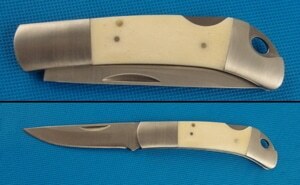 Custom designed white bone handle knife perfect for pocket, sheath or lanyard. The white bone handle is ideal for scrimshaw and the beautiful images you can create. This ia a quality white bone handle knife at a low, low price. * Scrimshaw ready. All preparation, sanding, and polishing has been done. * Strong 420 stainless steel blade. • Can be put on display or carried on a cord, clip, in a sheath or in the pocket. the U.S. please Click Here to inquire or order by email.